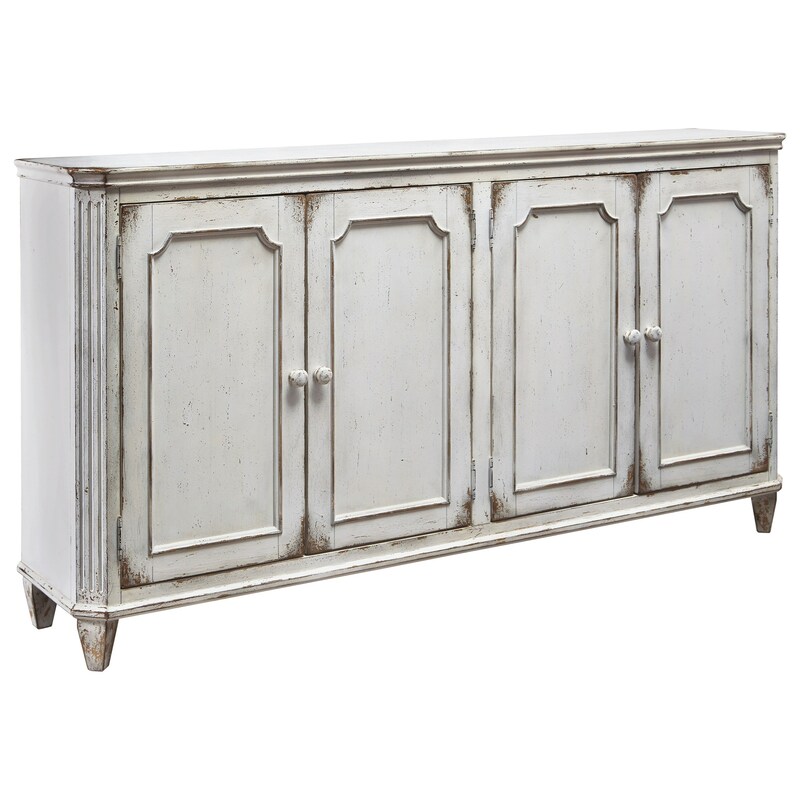 Resembling a French flea market find, this large accent cabinet shows off a distressed antique white paint finish and classic details with molding on its four doors, angled corners with fluted trim, and graceful cone shaped feet. Two adjustable shelves and two fixed shelves inside provide useful storage to this beautiful piece that is ideal for a living room, dining room, or entry way. The Mirimyn French Provincial Style Door Accent Cabinet in Antique White Finish by Signature Design by Ashley at Miskelly Furniture in the Jackson, Pearl, Madison, Ridgeland, Flowood Mississippi area. Product availability may vary. Contact us for the most current availability on this product. Storage Door opening (2) 28.38" x 12.13" x 27.50". Adjustable shelf 32.00" x 10.63" x 0.75"
The Mirimyn Cottage Accents collection provides plenty of options to choose from. Each piece is made with select veneer and hardwood solids with a gently distressed vintage painted finish. Take your pick from any of the options available to introduce a unique accent piece with cottage style to your home. The Mirimyn collection is a great option if you are looking for Relaxed Vintage Cottage furniture in the Jackson, Pearl, Madison, Ridgeland, Flowood Mississippi area.